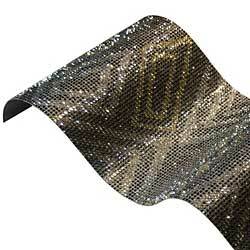 Swarovski Crystaltex Bandings Motives 66000 is an article within their Plastic Trimmings product range. This can be wonderfully used with many base materials and many different XILION Flat Backs. This comes in varied colour range which makes tone-on-tone combinations delightfully possible. Easy to cut and apply. Can be applied via Hotfix, sewing, or gluing. Suitable for shoes, accessores, textile, jewellery, interiors.